When: Saturday, April 6, 7:30 pm E.S.T. Perceptions change quickly in MLS. Remember when Philladelphia Union’s season was over after consecutive losses to start the year? Now, the Union are looking to extend their win streak to three and unbeaten streak to four this Saturday at Talen Energy Stadium. In their way stands a unique challenge. FC Dallas comes to town having collected 10 of a possible 15 points to begin their campaign. Just like the Union, they’re coming off an impressive road victory, easily dispatching a 10-man Real Salt Lake side. Historically, the two teams are even when squaring off in Chester, Pa. The clubs have scored eight goals each and both have an identical record of 1-1-3. But that record isn’t the only similarity the clubs share. It’s been written about to the point of exhaustion, but Dallas and Philadelphia are two of the handful of MLS clubs driving youth development in America. It’s without a doubt the story line of Saturday’s showdown. When longtime Dallas manager Oscar Pareja left to helm Club Tijuana in Liga MX, it was fair to wonder if the club would take a step back. Never big spenders, Pareja led the Toros to four playoff appearances in his five years in charge, and only failed to advance in postseason play once. FC Dallas chose to promote from within and named Luchi Gonzalez as their new manager. It’s fitting that the club know for their Homegrown development promoted the man who served as their Academy Director from 2012-2018. It’s even more apt given Gonzalez’ age. Only Colorado Rapids manager Anthony Hudson is younger than the 38-year-old former Mac Hermann award winner. Gonzalez has doubled down on trusting young players to produce results. Four Homegrowns featured in the lineup that won last weekend and as a whole averaged just 23.5 years of age— nearly three full years younger than Philadelphia’s average of 26.4. Dallas’ No. 10 Paxton Pomykal has all the hype following his two-goal “MLS Team of the Week” performance, but don’t overlook his teammate up top. Fellow teenager Jesus Ferreira has more than filled in at forward for a team whose depth at that position has been decimated by injury. At Rio Tinto, Ferreira recorded the first goal and two assists of his career. Union manager Jim Curtin couldn’t have been pleased with the play of his back line to start the season. 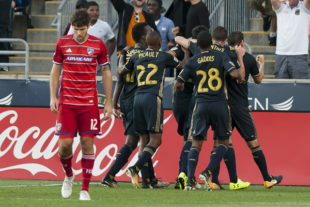 The former center back saw his team allow five combined goals in the two losses to Toronto FC and Sporting Kansas City. That trend has shifted, though, with Philadelphia currently enjoying a 200 minute shutout streak. There were always going to be growing pains stemming from the shift to the 4-4-2 diamond, but the defense is locked in right now. In the win over FC Cincinnati, the club posted its lowest ever expected goals against. Going back to the Union’s victory against Columbus Crew, the team has allowed only 10 shots during that two-match stretch— a franchise record. Center backs Jack Elliott and Auston Trusty aren’t just balling on defense. Their ability to pass from the back, along with deep-lying midfielder Haris Medunjanin, are crucial to the team’s success in attack. All three players are averaging over 50 passes per game while completing at marks of 81.5%, 77.1%, and 80.6%, respectfully. It’s easy to write this off as insignificant and without meaning, but the trio constantly shift the angle and often produce incisive, forward balls to unlock otherwise resolute defenses. For all the criticism of Medunjanin, only Philadelphia’s No. 10 Marco Fabián produces more key passes per game than the Bosnian No. 6. There’s no reason to be cute here. This is the marquee main event. Brenden Aaronson and Pomykal are two of the best, young American attacking midfielders. They won’t be going head-to-head, but almost everyone invested in this league will be tuning in to compare the two teenagers. How will Aaronson compare to a player most national media members consider to be the superior talent? Usually this is the “Player to watch” segment, but no need to be redundant. Instead, the battle on the Union’s left flank deserves some attention. FC Dallas right back Reggie Cannon is another prized Homegrown and has already been capped for the U.S. National Team at just 20 years of age. The Union’s Kai Wagner has been the club’s best player so far this season. As both forwards bomb upfield, it’ll be curious to see how the other reacts and defends. With all this talk about youth, the Union’s veterans will make the difference. Their experienced midfield consisting of Alejandro Bedoya, Fabián, and Medunjanin won’t allow FC Dallas to reach 600 passes and will prod and probe a disciplined Dallas defense. In the end, the Boys in Blue will score the game’s only goal. Two attacking American homegrown’s on the marquee….how about that? I read on Twitter that American attacking teenagers scored twelve goals in MLS last season, which has already been equaled this season.